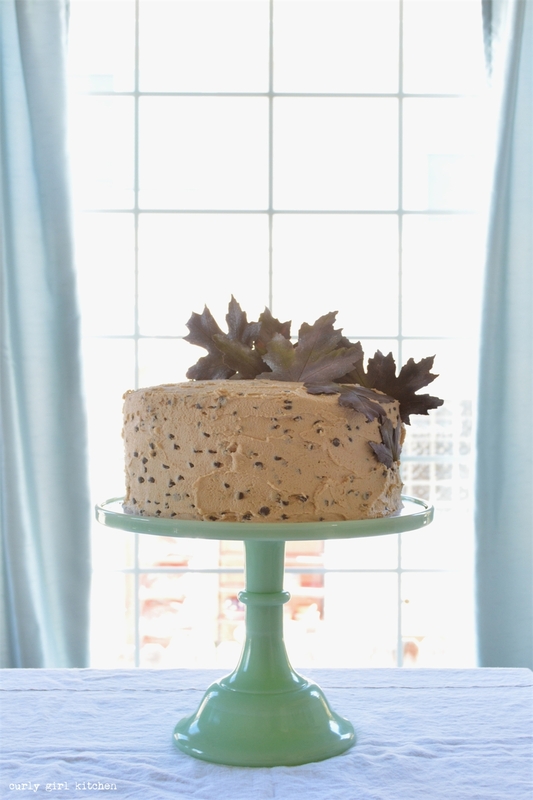 This is the next post in my series of classic cake recipes. First, there was vanilla cake, then a light and fluffy white cake, and now it's time for chocolate. 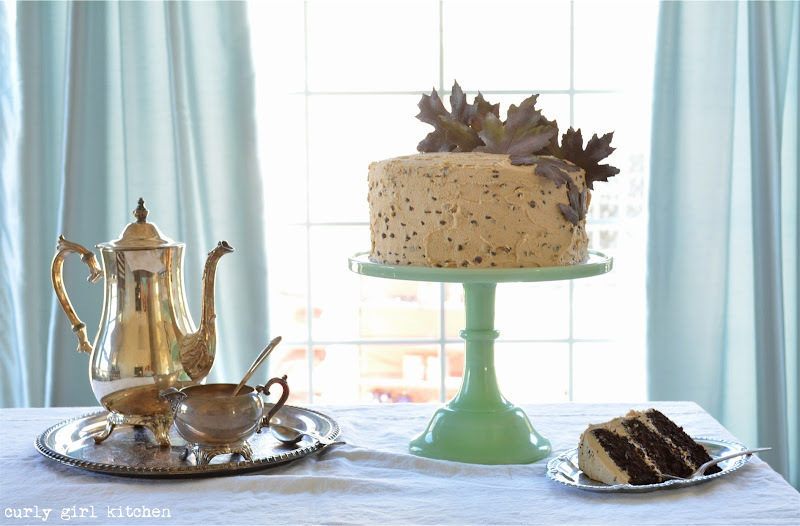 I have several variations of chocolate cake recipes in my blog archives, but when someone asks me for just a good, classic chocolate cake that a beginner baker can make, this is the one I recommend. Both the ingredients and preparation are simple and un-fussy, and although it's chocolate, which is inherently rich, the cake still manages to taste light. 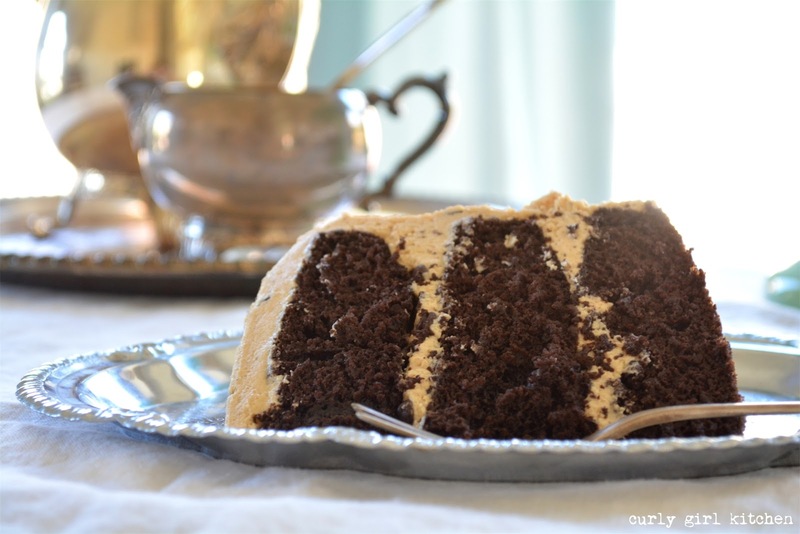 The secret to this chocolate cake is the boiling water, which "blooms" the cocoa powder and enhances the flavor of the chocolate for a truly luscious cake. And my own personal not-so-secret ingredient when baking with chocolate is espresso powder. A tablespoon or two adds a wonderful depth of flavor to chocolate that I think is pretty wonderful. I used to buy the expensive stuff from Williams-Sonoma, forced to use it sparingly because of the outrageous price; so imagine my delight when I found instant espresso powder at Target for a fraction of the cost. Not to mention, I really dislike trips to the mall, even for stores like Williams-Sonoma, where surely I can't help but leave with an overpriced set of whisks, expensive candles that smell seductively of pumpkin spice cake and French apple tart, a souffle dish for the souffles I will never make, and decorative pie crust cutters in this season's designs. 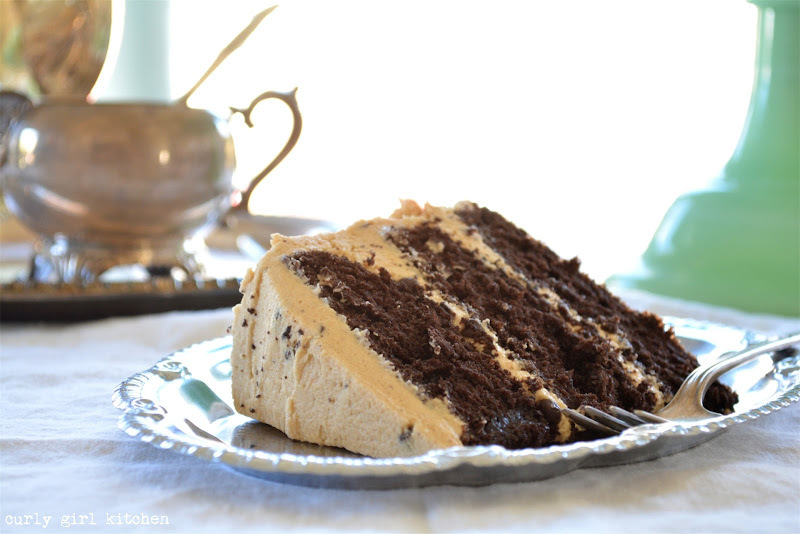 The buttercream on this cake is amazing. 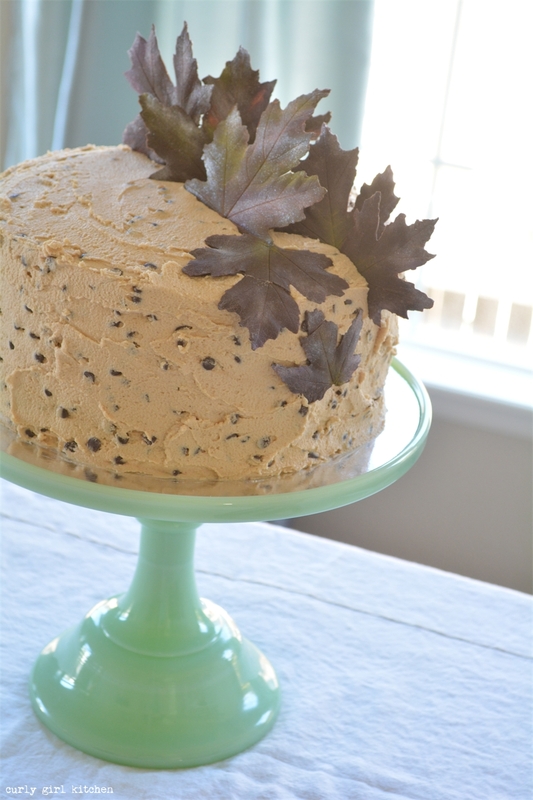 It's a peanut butter buttercream, with a little brown sugar which adds a pleasant grittiness that I like, rather than the standard fluffy buttercream. A pinch of salt counters the sweetness and mini chocolate chips add wonderful texture to each bite. 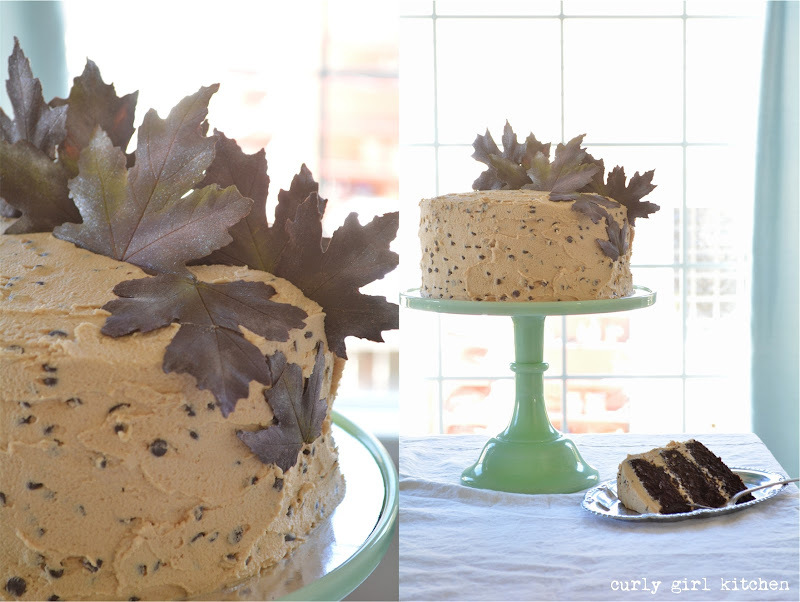 Since we just passed the first day of fall, I have embraced the season by decorating my cake with delicate chocolate leaves. I haven't included a tutorial for the leaves, because there are many, many tutorials online that you can research if you'd like to make some. I used the leaves from the maple tree in my back yard for mine, and they turned out so pretty. After the chocolate hardened and I peeled off the leaves leaving the impression behind in the chocolate, I brushed them with luster dust in shades of red, purple, green and silver to mimic the colors of the leaves outside that are just starting to turn. I love fall. Preheat the oven to 350 and grease three 8-inch pans with non-stick spray. In the bowl of your stand mixer fitted with the paddle attachment, combine the dry cake ingredients. Add the wet ingredients and mix on low for 30 seconds then on medium for 3 minutes. Batter will be thin. Divide batter between the cake pans and bake for 18-22 minutes, until a toothpick comes out clean. Cool completely in the pans set on wire racks, covered loosely with a clean towel. For the buttercream, beat the butter, peanut butter and brown sugar for 3 minutes. With the mixer on low, add the powdered sugar and meringue powder until combined. Add the salt, vanilla and cream; whip on medium high for 4-5 minutes until light and fluffy. Stir in the chocolate chips. The leaves are ir's crowning glory! Love it with the beautiful window too.. I love our dining room window, too. So many years in a condo with hardly any windows, and our house now has such beautiful light. LIght is SOOO important..you will always be a little happier in a home with light. 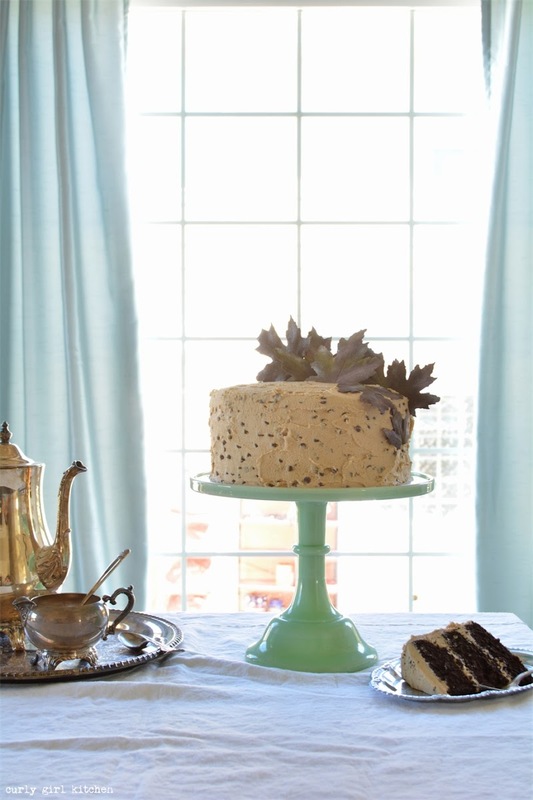 Vintage cakes are the best sometimes! And this one looks like no exception--I adore that chocolate chip pb buttercream, looks fabulous. 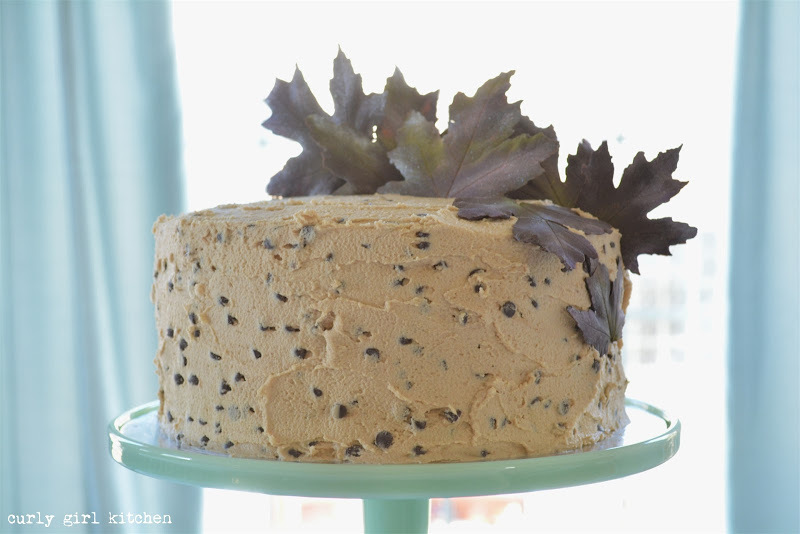 Seriously, I need to try putting chocolate chips in frosting! 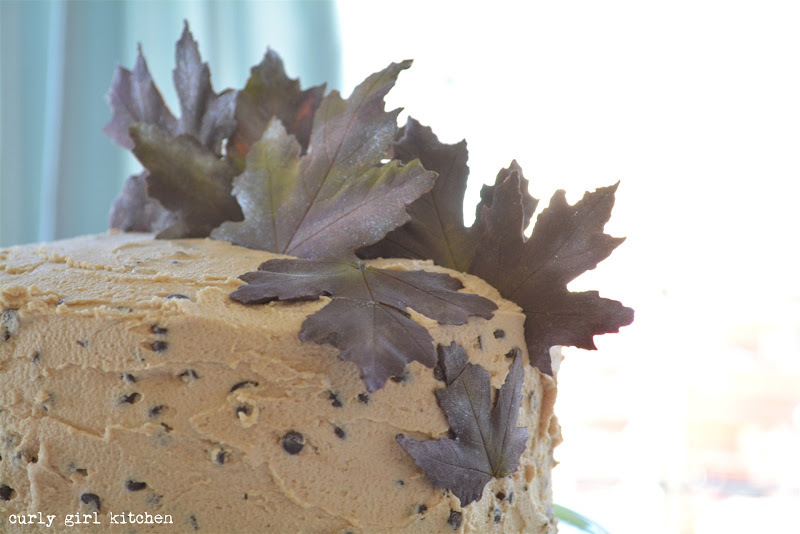 You should try the chocolate chips, or shaved chocolate in buttercream. I love the texture it adds. This looks so good! Can I leave out the espresso powder or do I need a substitute? (i can't have coffee).